Clearaudio offers a wide selection of phono preamplifiers. There’s something here for every budget and performance requirement. These well conceived solid stage designs are versatile and meticulously constructed. We’re pleased at the opportunity to offer these fine electronics. Call us at 573-696-3551 or email us at info@audiointelligent.com for answers to your questions about analog and Clearaudio. The Clearaudio Nano V2 provides real high-end performance at a truly budget price. Clearaudio has achieved this breakthrough by using a simple, elegant and astonishingly effective design perspective. The printed circuit board is embedded within a massive precision-CNC-machined aluminum block that forms a resonance-free chassis. The miniature size of the Nano V2 ensures outstanding technical results and unheard of quietness within its price range! The latest sophisticated surface-mount technology is used in conjunction with precision electronic components and extremely short signal paths, leading to a pure, hum and noise-free music reproduction. The fully dual-mono design features separate left and right switches for input loading, gain control and MM / MC selection, and a subsonic filter. 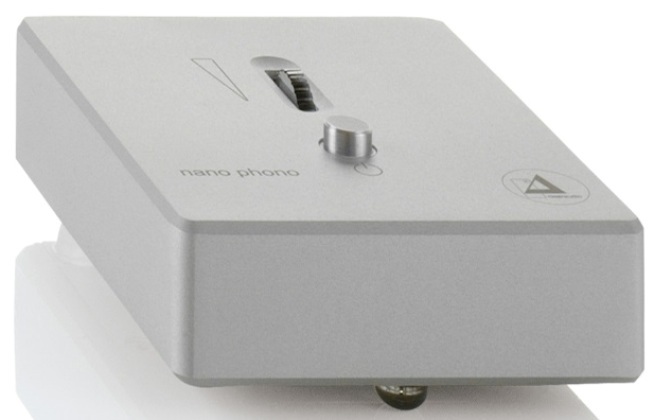 The Nano V2 will extract the best results from virtually any phono cartridge. Download the Nano V2 owner's manual here. 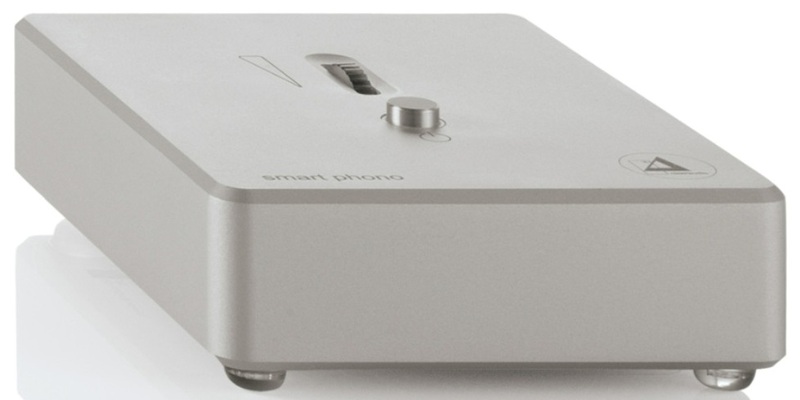 The Smart V2 phono preamplifier offers both moving magnet and moving coil capabilities, with enough gain to drive the lowest output cartridges. It is a very simple unit to operate with provision for both moving magnet and moving coil functionality. The Smart V2 features variable gain and load and a subsonic filter. The electronics in the signal path of the Smart V2 have been upgraded from the Smart to offer increased clarity, definition, and retrieval of fine detail. The layout of the circuitry is optimized for high channel separation, complementing Clearaudio phono cartridges. The Smart V2 is a high performer at a reasonable price. Download the Smart V2 owner's manual here. 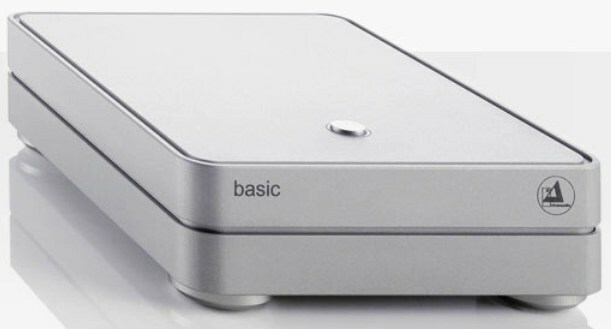 The Basic V2 phono preamplifier is switchable to match both moving coil and moving magnet phono cartridges, and has enough gain to drive the lowest output cartridges. Signal-to-noise ratios are 72dB for moving magnet cartridges and -67dB for moving coil cartridges. The layout of the circuitry is optimized for high channel separation of greater than 90dB, complementing Clearaudio phono cartridges. All of our phono preamplifiers use the Clearaudio non-magnetic MPC RCA jacks. The Basic V2 features and newly redesigned internal power supply that is fully shielded and a subsonic filter. Impedance is switchable between 47k Ohms for moving magnet cartridges and 500 Ohms for moving coil cartridges. RIAA accuracy is within 0.10dB. The Basic V2 is available in your choice of black or silver finish. Download the Basic V2 owner's manual here. True symmetrical layout, balanced (XLR) and single ended (RCA) outputs, and superb channel separation are special features of the Balanced Plus phono stage. The audio chassis circuit board is housed in an extruded aluminum block that protects against unwanted vibrations. The double sized power supply is housed in a separate chassis. Dedicated for MC cartridges, the Balanced Plus is an excellent choice for use with balanced input line stages. One example of Clearaudio's commitment to quality control is their meticulous in-house quality procedures, including both measurement and listening tests. It is their firm belief that these in-house tests are the best way to assure utmost product quality and value. Download the Balanced Plus owner's manual here. 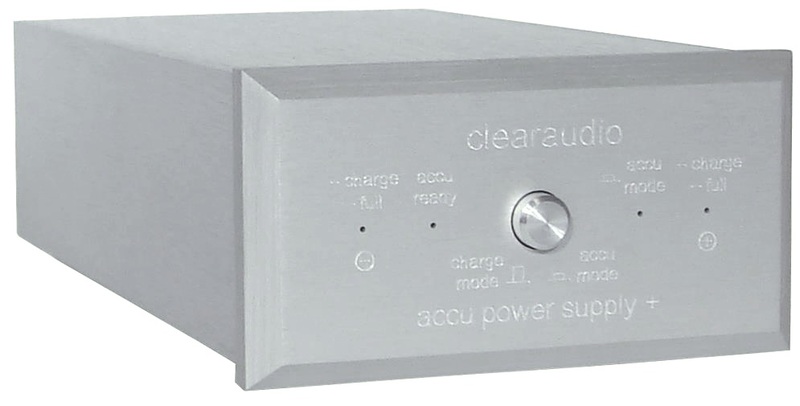 Cutting edge technology using high performance NiMH batteries is incorporated into the Clearaudio Accu Plus power supply unit. Battery power guarantees that no noise or distortion from the mains supply can pollute the delicate signal. It is designed to provide low-noise battery power to the Basic Plus and Balance Plus models. Download the Accu Plus Battery Power Supply owner's manual here.